Seventy-three law enforcement agencies across the country will receive $20 million in federal grants to help them purchase and implement the use of body cameras, the Justice Department’s Bureau of Justice Assistance announced Monday. 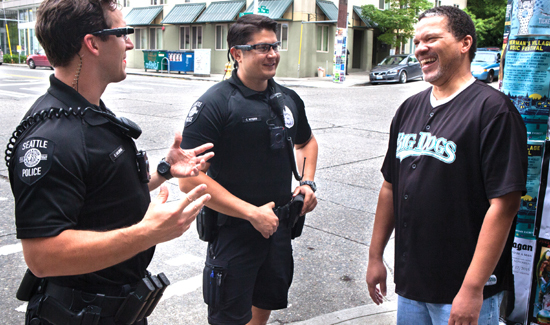 The grants will help the departments to purchase 21,000 body-worn cameras—fewer than half of the 55,000 cameras that 285 law enforcement agencies have requested. Separately, the DOJ’s Office of Community Oriented Policing Services announced it was giving out more than $107 million to help nearly 200 agencies hire or retain 870 officers. Law enforcement agencies that stressed community policing strategies received special attention for more funds, according to the DOJ. Large police departments in Los Angeles, Washington, Miami-Dade County, Chicago, Detroit, and San Antonio received $1 million each to implement body-worn camera programs. Other cities and counties that received large grants for body cameras include: Glendale, Arizona; Pasadena, Sacramento and San Bernardino County, California; Colorado Springs, Colorado; Stamford, Connecticut; Orlando, Florida; Wichita, Kansas; New Orleans; Minneapolis and St. Paul, Minnesota; Fayetteville, North Carolina; Albuquerque, New Mexico; Las Vegas; Rochester, New York; Pittsburgh; Charleston, South Carolina; and Seattle. I agree that body cams should be standard issue. The problem I ave is that every police department will have a different standard regarding the circumstances in which the video will be released, different standards regarding video retention and what the video will be used for after collection. The ACLU has recommended some sensible guidelines that I feel should serve as the basis for any policy. Secondarily, to eliminate the problem of missing video, malfunctioning equipment, etc, We should adopt a rule similar to “poison fruit” In the cases where video should exist and doesn’t, the benefit of the doubt should go to the defendant. Body cams do not serve the public if the videos aren’t readily available to the public for review.